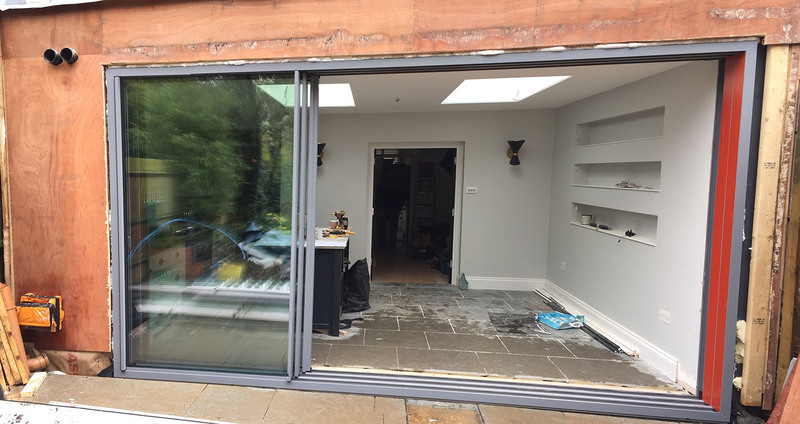 At last the windows have gone into our latest Highgate project. After weeks of temporary hoardings, it’s fantastic to see the full-height, triple-glazed sliding windows (by IQ Glass) flood this new space with light. This scheme is an extension on a Victorian terraced house. We’ve worked hard to make it simple but beautiful, replacing a draughty and energy-wasting conservatory and creating a more sensible circulation route from the entrance hall and kitchen. We’ve also moved the dining room into adjacent to the garden so the whole house now has a more direct relationship with the exterior. The deVOL kitchen has already been installed so you really get a sense of how the finished spaces will feel. Bespoke French doors and Holloways of Ludlow lamps complete the interior. The exterior will be finished with bright lacquered copper standing-seam cladding in the coming weeks.